When the topic of video game addiction comes up, most people immediately picture a 13-year-old boy absorbed in his Sony PlayStation or Xbox. But gaming addiction also affects adults. From the executive to the stay-at-home mom, the compulsive use of video, computer, and internet games causes some adults to ignore or neglect important work and family obligations. Gaming is for Adults Too! The association of gaming as an exclusively children’s activity is a dated stereotype that has its roots in the emergence of gaming as a popular choice of entertainment. Although modern video gaming traces its roots back to the 1970s, the millenial generation (born in the 1980s/90s) was arguably the first to grow up in what could be described as a true “gaming culture”. The advent of so-called “fifth-generation” consoles and games such as the Sony PlayStation and Nintendo 64 ushered in an era of gaming that was far more immersive, realistic, and compelling than anything that had come before. Crucially, this era of gaming marked a radical jump from 2D to 3D graphics. Offering a broad range of titles and a more entertaining experience than ever before, fifth-generation consoles swept households across the world. Meanwhile, growing access to faster and more powerful home computers fed a boom in computer game sales. Now adults themselves, a large percentage of millenials have continued to enjoy gaming as a form of recreation, or simply as a way to blow off steam. Expecting millenials to abandon gaming in adulthood is no more reasonable or helpful than expecting the boomer generation to abandon color TV. The point of this trip through history is to emphatically debunk the idea that only children can be affected by a gaming disorder. The average age of gamers in America is 34. There is absolutely nothing wrong with enjoying gaming at any age. But stigma related to inaccurate stereotypes can prevent adult gaming addicts from coming forward to seek help. Many adults feel overwhelmed by their responsibilities. These days, it’s not hard to understand why. Adults are frequently called upon to balance demanding jobs, the needs of spouses and children, and problems with ailing parents or friends in crisis. Everyone needs time to relax, unwind, and take their minds off real life. This is where video and computer games come in. For most adults, the occasional car chase or shooting match in a video game can relieve stress and provide an hour of light entertainment. But those who begin to play video games excessively may become so engrossed in the virtual fantasy world that they shirk their responsibilities and other interests. In addition, adults addicted to gaming may have physical symptoms like difficulty sleeping, migraines, back and neck aches, dry eyes, or carpal tunnel syndrome. Video game addicts also may become so preoccupied with earning the high score or reaching the next level that they forget to eat, shower, shave or take care of basic hygiene. If you are concerned that someone you know may be struggling with video or computer game addiction, the following are a few warning signs you may notice at home or at work. One of the first people to notice compulsive computer or video game play is the addict’s spouse. Close friends and family members may be affected as well. 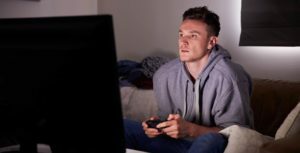 When a video game addict spends more time playing games than playing with the kids or talking to his spouse, marital and relational problems frequently follow. In addition to ignoring friends and family, the gaming addict may neglect household responsibilities and chores in favor of “screen time,” and may lie to family members to avoid admitting he has a problem. When a person is hooked on computer and video games, his or her work performance often suffers. In many cases, the gamer has lost valuable time and even sleep playing games like “World of Warcraft” or “GTA V,” and is too tired to complete their daily tasks. Falling asleep on the job or failing to complete assignments on time may result in disciplinary action or even termination. What’s worse, some video game addicts will go so far as to play games during work hours, using company computers and equipment. Even when their lives are crumbling around them, gaming addicts put video and computer games above all else. As an adult, you may not have parents or other authority figures monitoring your behavior. If you notice some of these red flags in your own life, it is up to you to get help. If you have noticed any of these warning signs in a friend, family member, or colleague, lend your support and share your knowledge. There are dozens of counseling and treatment options available for those dealing with compulsive behaviors like video game addiction.